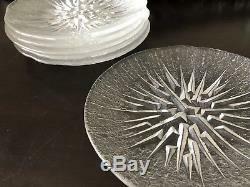 Beautiful Vintage IITTALA Finland LUNARIA Tapio Wirkkala set of 6 glass salad plates. 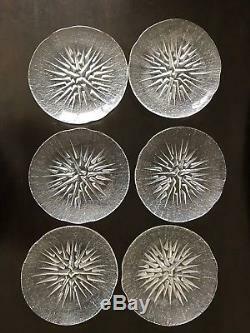 Designed by Tapio Wirkkala for Iittala, these plates show the intricate texture and glass blown ice pattern strikes running from the middle. The design is carved into a wooden mould which gradually burns with each peace and the pattern very slowly changes from piece to piece. 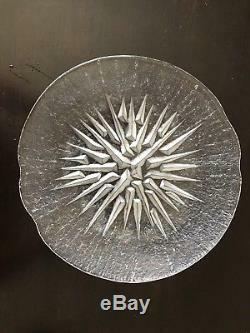 Plates have organic shape, not a perfect circle. 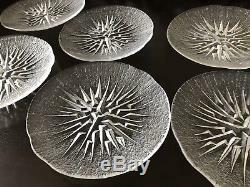 There are 6 pieces, 8 dia each - good vintage condition, some scratching and clouding appears from usage and dishwasher soap. Thank you for your interest! Please view my other listings. 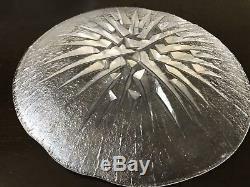 The item "Set of 6 rare IITTALA Finland Lunaria Tapio Wirkkala Glass Salad Plates 8" is in sale since Tuesday, November 13, 2018. This item is in the category "Pottery & Glass\Glass\Art Glass\Scandinavian\Other Scandinavian Art Glass". The seller is "ikaz5213" and is located in West Palm Beach, Florida.